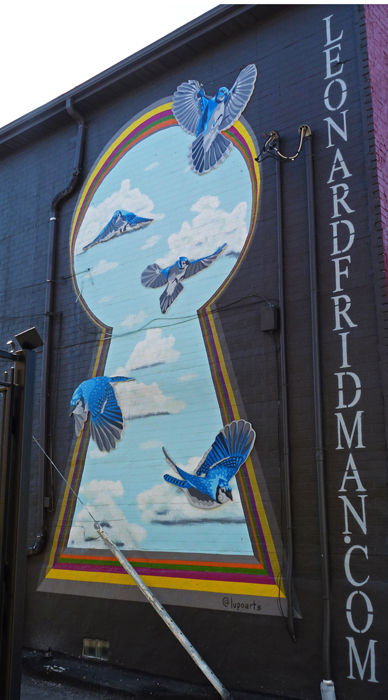 I spotted this great mural on the side of a building along Harbord St. It was along a narrow laneway so it was hard to get back to get a pic head on. The Blue Jays are additions glued onto the sky which is painted on the wall. The artist for this one is lupoarts aka Luke Pollard. This is one of my new favourites. That is really a pretty mural. Love those birds in their various configurations! And the colors. I can see how this would become a favorite. It's so cheerful and fun. A flight of fancy that lifts the spirit!! I'm curious about the electrical connection at the top right. It doesn't make any sense. Go back and ask them what the heck is going on! Blue Jays... the most popular team in T.O. A great effect with the birds. It's a great one Pat, love the keyhole. Indeed a very nice view and it comes to you via the key hole. Very clever. Precioso mural Pat. Los pájaros quieren salir volando. Wow, it's as if they're flying off the wall! It is a nice one. There must be something about Toronto and blue jays, witness the baseball team.